A runny nose or snot in children are quite common. Often they have children who attend kindergarten or other mainstream institutions. A runny nose is the result of incipient diseases of the respiratory tract. But this is not always the case, there are times when snot is observed in children only in the morning and throughout the day they are not. If the child is breastfed is likely to nasal discharge in the morning brings a lot of trouble as the boy's mother and to the child. Causes of runny nose in the morning may be several. Viral or infectious diseases and sometimes can be in a latent or chronic form. The body of the child up to 7-8 years only forms the immune system and, consequently, the morning runny nose at them - a phenomenon which is not insurance. This is a normal reaction of the body to "invading microbes". The following causes of rhinitis include the allergic reactions when the child inhales a specific allergen, these include not only various aromatic products such as perfumes, washing powder, the dust, foods, animal dander. 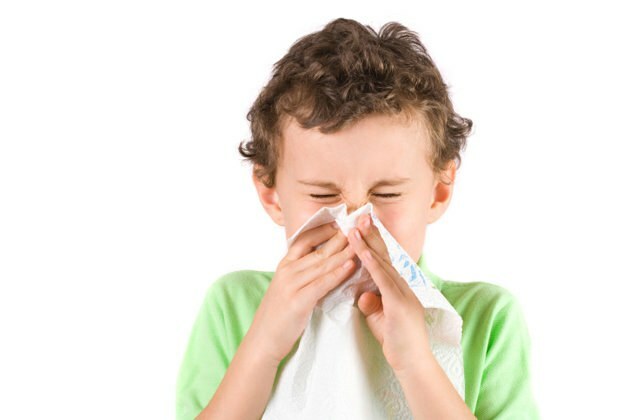 A runny nose in a child will be as long as you did not eliminate the child's contact with the allergen, will not detect and will not remove it. If the child's body the allergen acts for a long time, he may develop asthma. In the case of allergies show the child the doctor, who after examination will prescribe you taking any antihistamines. In addition, other causes of mucus in a child can be attributed to various injuries, enlarged adenoids or reaction to various medications. Hypothermia, incorrect dressing of the child, and poor nutrition also easily provoke a secretion of mucus. In the house where the child is, it is necessary to wet cleaning, 2 times a day. Ventilation is also recommended if the cold is caused by a viral or infectious bacteria. If the child is not able himself to get rid of snot, he needs help, this can be done using special devices. To start treatment mucus by using medicines, you need to find out the cause of the common cold, it can be done in the hospital. There you will be prescribed a special medication that will help your child get rid of a cold. Remember that you need medication from this disease can not be used on the advice of friends or acquaintances, as children may be allergic reaction to any component that can lead to anaphylactic shock. Many of us do not perceive the cold as a disease. Meanwhile, it affects our well-being, not only depriving us of the sense of smell, but also hampering the flow of oxygen in the body. It is especially hard tolerated runny nose small children. How to deal with it? The treatment of the child from the common cold needs to begin immediately with the first symptoms. If this is done quickly and adequately, it is possible to stop the common cold at the initial stage and do two or three days of illness instead of the usual seven. Usually, the first symptom of an approaching cold sneezing is increased. It indicates the abnormal state of the nasal mucosa and increased sensitivity to allergens, dust, germs. During this period, should begin to irrigate the nasal mucosa by preparations made with the use of sea water, which is well clear the nose. For example, it can be Aqua Maris, Marker, or other types of pain. When using them, pay attention to the method of application. For children up to years, it usually drops after a year, you can use the spray. If you stop the common cold at the initial stage failed, and her nose appeared serous discharge like clear water as the treatment to use drugs strengthen local immunity. Drops better use of human interferon in a dosage of 0.25 ml in each nostril 2 times a day. A very good result shows the IRS-19 in the form of a spray, one injection in each nostril 2 times a day. Before using such medications be sure to rinse the nose with saline solution and cleaned of all content, using different aspirators. Some moms use a piece of rubber tubing, but special aplausos certainly help to clear the nose of the most complete. Use of vasoconstrictor drugs type: Nazivin, Nazol, Pinosol should be very careful, it is better for the night, since they cause quick addictive nasal mucosa. On the background of the use of these drugs it is desirable to use restorative herb enhances the immune system. This may be the first sign or Immunal. Such funds should be applied at least a week for the occurrence of defined therapeutic effect. The treatment of the child will be the most complete if, in addition to improve nasal breathing to use a special patch with essential oils, fastening it at night, for example, on your chest? child. Snot and salt - washing. The nose is washed with salt water (teaspoon of salt is 0.5 cups of hot water). Salt is better to take sea. A liquid for rinsing is poured into a wide container and draw her nose, alternately closing one or the other nostril. Snot and calendula. From snot and chronic rhinitis will help to get rid of tincture of calendula. Colds today are the most common. Most often it all starts with a cold, and if it is not cured, the consequences can be very unpredictable. How to get rid of snot in the home, you know in any family. Someone trusts medicines and various drops, and someone resorts to traditional methods of treatment.